In February, Dr Sébastien Lobet became the new Physiotherapists Committee Chair, taking over from Mr Piet de Kleijn. 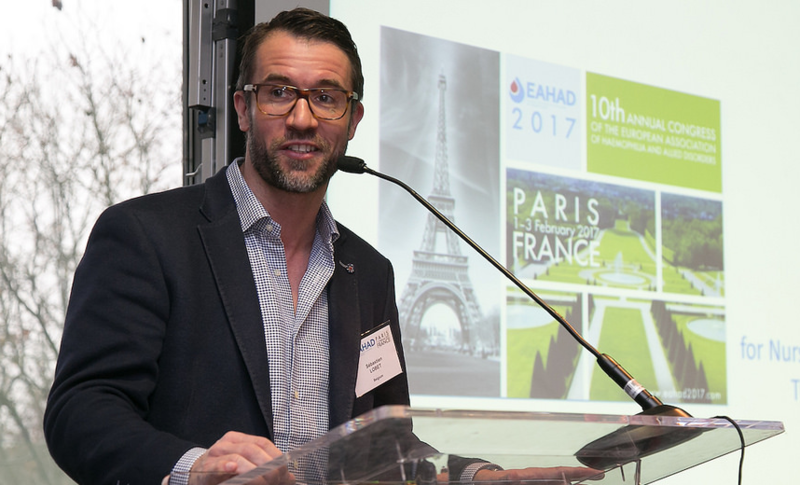 At the EAHAD Congress in Madrid, Spain, we sat down with Dr Lobet and asked him to shed some light on his background, the highlights and challenges associated with his work, and his ambitions for the committee and for physiotherapy for bleeding disorders in Europe. I am a physiotherapist and researcher at the Haemostasis and Thrombosis Unit at the Cliniques Universitaires Saint-Luc in Brussels. I am also the manager at the Da Vinci Exercise Medicine Centre in Wavre and Waterloo, Belgium. How did you become involved in haemophilia treatment? I treated my first haemophilia patient back in 2001. At that time, I was working in the orthopedic department and my patient came in for a total knee replacement. I did not know anything about haemophilia but was very much interested to learn more. Through this experience, I met Professor Cedric Hermans, who asked me if I wanted to get involved in the regular joint assessment of haemophilia patients. I subsequently had the opportunity to attend my first musculoskeletal congress in 2003. Since then, my interest in the disease has only grown. What was the first EAHAD Congress you attended? The first EAHAD Congress I attended was in Brussels in 2014. What motivated you to help form the EAHAD Physiotherapists Committee? I always give my 100%, when I have the opportunity to work quickly, constructively and autonomously. So, when the EAHAD Executive Committee supported the formation of the Physiotherapists Committee, I worked side-by-side with Paul (McLaughlin), David (Stephensen) and Piet (de Kleijn). We wanted to reach the same goal: improve the recognition of physiotherapy in Europe and help further develop physiotherapy treatment guidelines. I knew we had the trust of the Executive Committee, for which I am very grateful, and enough creative freedom, so the project was and still is very exciting. What has been your most memorable moment/achievement to date as a Physiotherapists Committee member? To be able to recruit, in the very short period of one year and a half, almost 200 physiotherapists working in haemophilia care to our network. This can only mean one thing: The Physiotherapists Committee has great potential! What do you hope to achieve in your two-year term as Physiotherapists Committee Chair? It is important to have a platform for European collaboration. This would enable us to exchange with our peers, who treat the same types of patients and face the same kind of issues. Through collaboration, not only will we learn from each other, further establish physiotherapy guidelines, and pinpoint the current status of physiotherapy practice in haemophilia care in Europe, but most importantly we will continue to develop our network with passionate and dedicated professionals. What do you think are the main challenges you will face? Access to prophylaxis is not equal in all European countries. While some regions benefit from good access, in others this is still lacking. With regard to physiotherapy services, the level of access and the quality of these services throughout Europe remain a big question mark. This is one of the main issues that the EAHAD Physiotherapy Committee will delve into. Sometimes, even within a single country, the services available to patients can vary greatly depending on whether the patient lives close to a haemophilia centre or in a more remote area. I would like to render physiotherapy accessible and affordable for every patient, including the option of close collaboration with the local physiotherapist (not working in the treatment centre nor having previous experience of the disease) or the option of home exercise-therapy, if needed. Do you have any advice for physios entering the bleeding disorders field? Be proactive, be proactive, be proactive! By working in this area, you will quickly realise that haematologists, paediatricians, orthopaedic surgeons and the other members of the haemophilia care team need the help of physiotherapists to achieve great results. We are, therefore, indispensable in the context of multidisciplinary care. It is crucial to use our expertise to help doctors with everything related to the musculoskeletal aspect of the disease. Do not be afraid to take initiative… you are indispensable. One last question, if you could choose a superpower, what would it be? To multiply myself in order to have equal time for work, family, sport, friends… and rock concerts!